Hi Div 17 and 18 parents! Here is a short note to let you know what will be happening in Math for the remainder of second term. Our Student Teachers, Courtney and Simon have returned to our classroom, which allows us some flexibility in our groupings for Math. Due to our large number of grade 7 students, we have created three small sized groups, two comprised of grade 7s and one comprised of combined grade 5 and 6 students. The smaller group size allows us to focus in on more intensive teaching, provides greater opportunity for hands-on learning and for students to build their learning with increased teacher support. The structure is that students will rotate, with their group, through three math units: Probability, Integers and Geometry over the next 8 weeks. In order to support a short timeline for these units, our expectation is that the students will be completing a greater proportion of the assignments outside of school time. This work can be done at home, and we always encourage parents to check in with their children and have conversation about the what they are learning at school, but if this is a challenge, the classroom is open before school, and your child’s teacher is available to help if support is needed. The exception to this rule is Tuesday, when the teachers attend our school Staff Committee Meeting. Thank you, as always, for your support and participation! Hello Div 17 and 18 parents! We are very excited to invite you in to our Open House next Tuesday, December 5. We are eager to share all of the amazing things we’ve done this year with you. Our classroom doors are open to parents between 2pm and 6pm that evening, and Tami and Jody will be there to chat with you and your child and to celebrate their hard work this term. You don’t need to make an appointment to come in, please just come any time between those hours. If you cannot come on Tuesday evening and would like to come at another time (before or after school), please email us and we will find a time that works for you and your family. You will receive your child’s report card at the conference, or if you are unable to attend a conference, we will send it home with them. This is not an early dismissal day, so ALL students will be required to stay at school until 3pm, and will be dismissed early the following two days (December 6 and 7), along with the whole school. The parents have organized a Book Fair on those days in the Multipurpose Room if you’re interested! I found this article this summer on promoting positive reading habits for older children in the Washington Post by Merete Kropp on August 24. “Read physical books. I spend a significant amount of time reading a variety of material daily. However, this may not be clear to my children, because much of the reading I do is on electronic devices. For all they know, I might be spending time as they do: playing games, watching videos or engaging in social media. Although reading books in an electronic format is convenient and easy, children need to see people they look up to clearly engaged in positive reading habits. That makes it critical for adults to read tangible books. Subscribe to print newspapers and magazines. Although much news-related reading in our family is done online, a printed version of the newspaper is delivered to our door every Sunday. The newspaper provides access to current events, news and editorial content our teenagers may not otherwise encounter. I leave newspapers and magazines on the kitchen table throughout the week. I occasionally catch my kids leafing through them, reading bits and pieces as they eat breakfast, enjoy an afternoon snack or fill a few idle minutes while waiting for their next scheduled activity. Schedule routine family meals. When our family takes the time to enjoy a meal together, we share not only the food but also the events of the day, including conversations about the books we are reading. These gatherings facilitate discussions on topics related to current events, ideas and opinions. These conversations offer insight into what each family member is doing, learning and thinking about and they bring us closer to each other. Listen to audiobooks. On our recent road trip we spent 30 hours in our minivan. I had looked forward to the opportunity to listen to a good book with mu husband, but never thought about requiring the kids to listen with us. I realized, upon stopping for a meal, that our children were also listening. They asked good questions and made insightful comments on the characters and the plot. At some point, they had stopped listening to their music and tuned into the book. Check with your local library to borrow books to listen to on phones and other devices. Listen in the car or while engaged in other activities. Give books as gifts. Children learn to value the things adults value when they are presented as special treats. Books can be given as gifts for birthdays and other occasions. A boxed set of books, a subscription to a favourite magazine or a book by a beloved author could encourage older children to read for enjoyment. Read (some) books your kids are reading. Books are more enjoyable when we share conversations about them. Books for young adults are interesting and engaging and we can learn much about our children’s worlds and values by reading what they read. We can also recommend our favourite books to our kids as a way of sharing our preferences and ourselves. Good morning, parents! Thank you for your support getting your children active on our class blog. I just want to take a minute to talk to you about why it is an important part of our curriculum and our learning. My hope with this blog is that it will serve many purposes for Division 16 students including the opportunity to communicate more effectively with families and to extend the dialogues in class. In general, topics for blog posts will fall into a few categories – providing extra opportunities to connect with material related to project content areas, activities that promote critical thinking and expressing opinions, and invitations to express creativity. Open Reflection – How many times do we actually just sit down and take time to reflect on what we have learned? How many times do we go to a conference and it is speaker after speaker after speaker, with no time to sit down and reflect on what we have learned? Instead of simply dumping information into our brains, we have to take time to think about what we are learning and make meaningful connections. Blogging has been hugely beneficial in doing this for myself because I have seen the benefit of sitting down, writing, and reflecting on what I have learned while also learning to create an emotional connection to the information. Through being totally open, I have had the opportunity to learn from the comments and advice of others as well, which has helped me refine my own ideas. By allowing our students to openly reflect, we do not only see what they learn, but they can learn from each other as well. Developing Literacy with Different Mediums – Blogging is a great way to write and share ideas, but there are many other ways that students can share content through this platform. Using a site like SoundCloud can give students an easy opportunity to share their actual voice with the world. YouTube is an obvious one, but even presentations through SlideShare are helpful to tell stories in many different ways. The nice thing about a blog is that basically anything with an embed code can be placed into that space. This gives many different opportunities for students to share their voice while becoming fluent in “21st century literacies“. Student Voice – Building upon the last point, giving students a space to share their voice is extremely important. 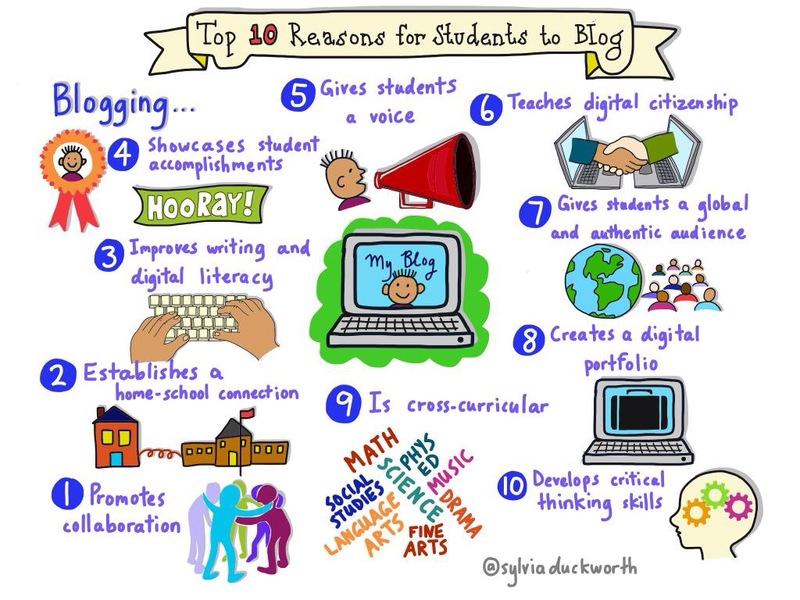 Blogging should not only be “school related” but “learning related”. In a blog, you may learn a lot about not only what students are learning in school, but what they are passionate about and hopefully how we could serve them better as educators. In a world where everyone can have a voice, isn’t essential that we teach students how to use this powerful medium to share theirs in a meaningful way? Creating an Open Archive of Learning – At any point, I can go back to the beginning of my blog and see where I have learned. Almost 600 posts later, I can see how I have grown and what my thought process has become and how has it developed. I have seen the power of this by recently looking at my Twitter archives, but that is in only 140 characters. Through my blog, I am able to look more in depth into what I have learned, and if I tag and categorize it properly, I am easily able to google my own work, as can anyone else. The opportunity to search that this medium provides makes it a lot easier to go back and revisit what I have learned in the past, as opposed to flipping through notebook after notebook, trying to find something extremely specific. Can you imagine googling your work from your childhood? Developing a Positive Digital Footprint – Recently I spoke to a university class on the notion of developing their digital footprint, and I simply suggested that they learn openly, and their footprint will happen. It has been suggested by Will Richardson that our students should be able to be “positive google”, by their name, by the time they graduate and I would totally agree. What are we doing as a school to promote a positive footprint? I wish that I could say that I had the foresight that when I first started blogging that this would happen, but after doing it for several years, I realized that this is only one, albeit very important side-effect of writing a blog. Our class blog is an important part of our learning. Please check in regularly, read up on the great thinking Div 16 students are doing and give feedback! Hi Parents! Welcome back to our alumni parents, and a special welcome to our new families! Thank you for checking our our blog! We are very proud of our website, both for the student posts and the “reflections” assignments. Please consider following our blog by clicking on the follow button on our homepage. This will ensure you receive an email every time there is a post on the homepage only. Parents, please feel free to comment on any of our posts or assignments. We love feedback! Division 16 is an exciting, vibrant, creative, democratic community. Please click on our “about” tab to hear about students’ perspective on our class community. We team together with Tami and Karim’s classes. This means that as teachers, we plan together, we work with each others’ strengths and experience and bring different voices and perspectives to our lessons and units. It also means that sometimes we will be all three teaching together, in the case of our Integrated Study units, that sometimes your child will be taught by one of us, in the case of Math, and that sometimes we will plan stations together and the students will circulate between our presentations. We also enjoy working with our Buddy classes (Wendy/Jeannie and Karen/Jenny’s K-1-2) and with Cheiree, our Teacher-Librarian, who is an expert on research and note-taking, among other things. Laurie Lee is our Resource Teacher and she works to support our program and students in many different ways. At this point, we hope to have a School and Student Support Worker in our class but we aren’t sure who that will be. We like to do open houses where we showcase our work on Integrated Studies rather than more traditional conferences. This fall, we have work planned on the upcoming Federal Election, a relevant and exciting Integrated Study Program that focuses on Social Studies and Science. In our class, we will be working on developing and extending our writing skills. Each week, on Monday and Thursday, students will be required to respond to an online homework assignment. If you do not have regular computer or internet access at home, students can complete the assignments at school before or after school, at recess and lunch. I am at school and the classroom is open at 7:45 each morning. Students are welcome to come to school early to connect with friends, read, complete classwork, or get extra help on assignments. Students may bring their own computers (laptops, ipads, iphones etc.) but they need to be responsible for securing them in the locked cabinet at recess and lunch. Use of these devices needs to be appropriate, and I cannot troubleshoot or repair personal devices, or be responsible for any issues if students choose to bring their own devices. We have a class set of old laptops that run Linux (Ubuntu) in the classroom and all students are welcome to use those. Please feel free to contact me by email if you have any questions about our program, the class or would like to discuss your child’s progress. Watch this space for updates a couple of times a term. Welcome! I hope to meet you all in person soon! Parents, we are so looking forward to having you come to our Open House on Wednesday after early dismissal. We will be set up in the Multipurpose Room with our This Moment In History projects. No RSVP is necessary, please just come with your child. We will be set up between 2pm and 5pm. This is a chance for you to see the amazing work your child has done with their partner for the project and to see the work of their classmates. We encourage you to wander through the presentations and look at the diversity of perspectives that represent our study of Canadian History. As mentioned before, we participated in the Neworld Theatre project “Me on the Map” back at the end of March. We were the pilot group for an event taking place at the Children’s Festival. This was an interesting and exciting learning opportunity where students had the chance to work on exploring the values that we bring to the spaces around us. Then the group from the theatre came for a participatory performance that helped us clarify our hopes for our community. Please check the posts on the blog and the assignments under the “Reflections” tab for student thoughts on the topic. Great News, the Children’s Festival has offered us a free pass for the Festival on May 27. We will go with our Little Buddies for the day. And Carl is off to the races with some really great new projects including a project on Ancient Civilizations centering around a Wonders of the World critical challenge, Writers Workshop and a unit on Fractions and Decimals in Math. May 7 will be “The Big one at 2”, our full release Earthquake Drill. This is the drill where we release students into family care with the signout. More information will be coming through newsletters on the procedure there. I can’t believe we are already in term 3! We have some exciting things on the horizon for this term and one of the first is that Carl, our student teacher will be beginning his long practicum starting the first week of April. He has some fun things planned and will be increasing to teaching 80% before phasing out at the start of June. We will be continuing with our This Moment in History projects. The students in our three classes completed some very successful dioramas portraying their “moment” and we are moving forward to complete the remaining two components of the project, the backdrop and the written essay over the next two weeks. We will be getting underway with our Future Technology project, imagining a current technology into the future in order to solve a problem. Our twice weekly blog post homework will continue, and thank you, parents, for your support in reminding students of this responsibility. In general, they are great topics for conversation, and as the blog is public, you can read up any time on what we are discussing in class. Homework is Monday and Thursday nights, except when those days fall on a holiday or Professional Development day. This term we will also be having an art therapy practicum student visiting our class to do whole-group art activities for about 10 hours. We will make sure to post about these opportunities on the Front Page or under the Curriculum Tab. Welcome back! I hope all Division 16 families had a safe, restful holiday and were able to spend time together! We have a busy term coming up! 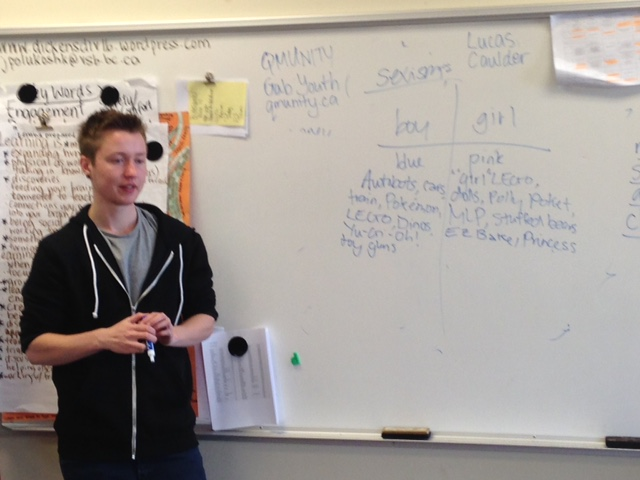 As last term, we will have our Student Teacher, Carl with us on Thursdays until Spring Break. After that, he will begin his extended 10 week practicum in term 3. We will be continuing our Trout Lake Skating PE adventures for three more dates, two with Tami and Karim’s class, and one with our Little Buddies. We will also be increasing our partnership with our Little Buddy class to do reading support with those students two times per week. We have just started a new Read Aloud novel, “Uglies” by Scott Westerfeld. Tami, Karim and our class will continue grade groupings for Math as we move into a unit on Measurement. We hope to have Cindy Diett and Constable Heather Montgomery resume their visits this term to share their experience about sexual health and personal safety. Our grade 7s will begin the process of articulation to high school! Our twice-weekly blog assignments have been a real success, and these will continue each week throughout the second term. In addition to these regular events, we have already begun two short term projects and are about to launch two term-long projects. This week we started our Math Measurement projects and our 20 second speeches (find more about these on our “curriculum” page). No spoilers on this page, so you’ll have to ask your student next week about those! Thanks, as always, for your continued support of our program and of your kids. I’m really looking forward to the great things we’ll do! Happy Holidays, parents! Just a quick reminder that we have a lot going on this week. For Wednesday, the students need to bring any candy required to build gingerbread houses. Many students submitted their “candy tax” after Hallowe’en, but any additional supplies need to come for Wednesday. Friday we are doing Camp Read, which means students may wear pyjamas and bring blankets, sleeping bags, etc. for making forts / tents / reading caves. The idea is that we read or do reading related activities all day long. As this is the last day of school, we will need all Camp Read paraphernalia to go home with students at the end of the day. Our engineers are in cleaning throughout the holidays. The students asked for blog assignments over the Winter Break. This week, on the Monday and the Thursday, assignments will be as usual. Over the two weeks of the break, I’ll post a new assignment each Monday (the 22nd and the 29th). December 10 – Mini School Test at Tupper 1PM – families are responsible for tranportation to and from the test. Dickens students traditionally walk to Tupper together at lunch. We will allow for an early lunch in order to make sure they arrive on time. Students must complete Tupper Secondary Grade 8 registration form. Studentshave registration forms distributed to them at Dickens. Cross Boundary applications will be considered as space permits. Students must complete an “Application for Cross-Boundary” form and deliver it to the Tupper main office by this date. The Cross Boundary application process opens February 2nd. Forms are available at the Dickens school office. Grade 8 students typically take English 8 and Social Studies 8 (combined into “Humanities”), Math 8 and Science 8 (combined into “Math/Science”), PE 8 (separate classes by gender until grade 10), French 8, Applied Skills rotation and a Fine Arts rotation. Band and Choir classes are taught as well, and some of these are “off-timetable”, which means they occur before and after school. Grade 8s meet together on the first day of school at a separate time form the rest of the students in order to meet the Principal, Vice-Principal Counsellors and Teachers. An August newsletter will be mailed home with further information about this. Thank you, parents, for supporting and encouraging your children last night at our Rock and Roll Hall of Fame Gallery exhibit. Your feedback and attention to other students in the class also helped to make the evening a great success! Good morning! This term we will be doing things a little bit differently with conferences. Due to the fact that we have been doing an integrated study this term that incorporates Language Arts (Reading, Writing, Oral Language), Social Studies, Research Skills, Technology and Art, what better way to present our learning than in a gallery exhibit of your child among the other students from Tami and Karim’s classes also presenting their projects? This event will take place in the multipurpose room and the Gym. There are two time frames, 2:00-4:00 PM and 4:00 – 6:00 PM on Wednesday, December 3rd. Please return your conference sign-up form as soon as possible. We understand that not all families will be able to stay for the entire two hours, and if your child needs to leave a bit early with you, that’s OK, but please understand that part of the criteria for the project is presenting and that this is an important time for students to be proud of their presentations and to recieve feedback on their hard work. Our Collaborative Reports have been completed by students and myself and are being reviewed. You will receive the Report at the Conferences. Today, we were fortunate to have guest speakers from Qmunity, a youth-serving organization visit our class along with other intermediate classes. The presenters talked about Discrimination and Bullying and talked about the underlying “isms” that can lead to bullying including sizeism, sexism, classism, racism among others, with a particular focus on gender sterotyping. They introduced LGBT (Lesbian, Gay, Bisexual and Transgender) as identity categories and about identity categories that may not be as visible and why using identity terms like “gay” as a negative or an insult is hurtful. Part of the discussion included talking about how to support individuals who are dealing with bullying or identity issues. We are hoping to have more discussion on these topics over the year. Please feel free to contact me if you have any questions about the content material. It’s time for Grade 7 students to begin thinking about Secondary School! If you are considering a mini-school program for your child, take a look at the important dates and information about the different mini-school programs available in Vancouver. On this webpage you will find information about each mini-program, dates for parent nights (most in the last week of October and first week of November) and information about the Cognitive and Skills test that is required for all applications for mini-school programs. The Test takes place on December 10 at 1 PM. We will walk with students to Tupper, where the test is administered. Students will have more homework this year. In general, work may be assigned for students to start and complete at home (such as the blog posts), or discussing the work of the day with their families. Often, however, homework will be assigned when students do not finish the day’s work in class. We use agendas each day to help students learn good planning and organizational skills and to increase their sense of responsibility and accountability. Please remind your child to check their planner each night and to remember it for each school day. Notices and forms for you will also be brought home in agendas. We know that your children are very busy! Between dance, soccer, piano and family, there isn’t much time in the evening, and we know that your quality time with them is important. Our classroom is open each morning at 7:45 and is open at recess and lunch. Students can work on any homework or projects during this time and I am available to help with any issues or support understanding before and after school. Welcome, new parents, and welcome back, Division 16 alumni parents! We have just begun a wonderful year, and wow, what a delightful group of students! This year, we are working hard to get our schedules settled and our timelines and projects started, and we are very close! This year, we will be working closely with Tami and Karim’s classes (Division 17 and 18) on a couple of really interesting projects. To start, we will be doing Math groups all together, with Karim leading the Grade 7 students, Tami will be working with the Grade 6 students, and I will be working with Grade 5 students to focus on number operations. This means practicing addition, subtraction, multiplication and division skills. To this end, we have asked all Grade 5 and 6 students to commit to 10 minutes every night practicing their multiplication skills. This can be done in whatever way works for your families – make flash cards, use the multiplication grid at the back of their agendas, use any one of a number of online math practice websites, have an older brother or sister quiz them… Having accurate and efficient multiplication recall will help in so many ways across the math subject areas. We are also beginning a project with Tami and Karim’s classes called “Rock and Roll Hall of Fame”. Through this project, the students will do independent study of one of the inductees of the Rock and Roll Hall of Fame and will explore the historical and cultural context of their chosen musician. We are looking for parent volunteers to share their own passion for members of the Hall of Fame with the class, so if you are interested, please let us know! We are going to work hard this year to keep our agendas an integral part of our day. Please try to check your student’s agenda nightly and ensure it is returned to school each day. We are also going to continue to keep this class blog relevant, exciting and full of student work. Please check often and please comment on student posts! We love feedback in our class and enjoy hearing from parents through this format. Hi Jody, Thanks for this information. It is very useful for parents. I will check blog regularly. Appreciate all your work on blog for students as well.